Probably everybody in IT has noticed the rising of Docker in last 2 years. 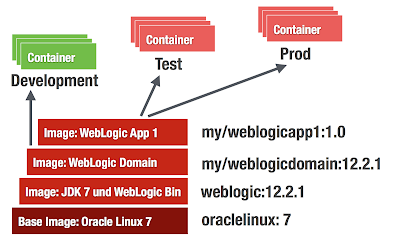 Since March 2015 Oracle has certified WebLogic Server on Docker. This is good news. Beyond all buzz around containerization and Docker in particular there is great use for it. Especially during development or testing of an application for WebLogic you can benefit without too much investment (time, skills). Further, since the first day of WebLogic 12.2.1 release it is certified on Docker. In preparation for one of my last talks lately I decided to checkout this new version. Subsequently are my experiences so far. Using the following Environment: WebLogic 12.2.1, Mac OS 10.11 , Docker 1.9, Docker Compose 1.5 . I will not go into Docker details here. There is a lot of introductorily Docker content available on the web. There are no prepackaged WebLogic Docker images available (basically because of user licence agreements) so the images must be build manually from Dockerfiles (provided at GitHub). The following figure shows the needed layers of images to actually start running containers. This is pretty straightforward. Just change into the sample directory and kick off the docker build. 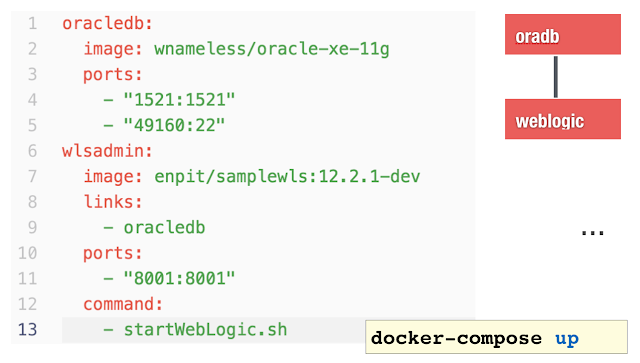 samples/1221-domain$ docker build -t enpit/samplewls:12.2.1-dev . At this point you have an image from that you can run weblogic containers. Having some Shell scripts included the image supports different types of containers to run. This is because of WebLogic Domain concept. See next Fig. The container starts the default command from the Dockerfile which in this case is "startWebLogic.sh"
So in my case I access the WebLogic Admin Console http://192.168.99.100:8001/console . Logging in with defaults weblogic / welcome1. 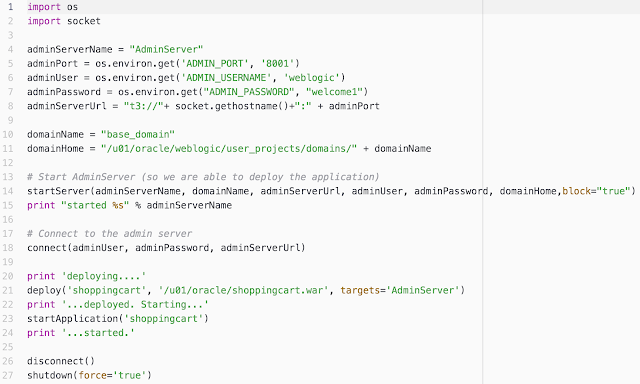 With the above command you can now start as many AdminServers (in its own WebLogic Domain) as you want. The createServer.sh Skript connects to the admin server, extends the domain by a machine (the container) and a managed server entry. Further it starts the NodeManager. Adjust the sample 1221-domain/ Dockerfile.emptydomain. Fix: I added the following underneath the statement "USER root"
Change the arguments for starting the managed server with additional argument. Note: After making those changes and rebuild the "empty wls domain image" the "createServer.sh"-script worked as expected for me. But I noticed an increase in the image size from 1.7GB to 2.3GB. Not sure where it comes from. Maybe because I tried some other changes to make the Dockerfile work for me. I need to investigate more and/or file an issue on that. Notice that the Admin Server is started during the build time in order to deploy to the AdminServer. docker build -t enpit/shoppingcart:1.0-dev . The following docker-compose.yml file configures and links an oracle database-xe container and a weblogic container. oracledb_1 | Starting Oracle Net Listener. oracledb_1 | Starting Oracle Database 11g Express Edition instance. wlsadmin_1 | Dec 16, 2015 10:19:14 PM GMT Notice WebLogicServer BEA-000360 The server started in RUNNING mode. This should just give you an idea that simple Docker containers are just the beginning. With Docker Compose (and Docker Swarm) there is more to come. Docker is fun and fast. It is easy to get started. The official provided WebLogic Dockerfiles on Github from Oracle help a lot to get started quickly. But be aware of that the Dockerfiles not meant to be perfect. 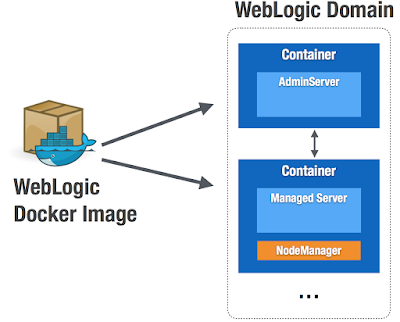 Its an example how to get started and build your own WebLogic Docker images. The sample domain had to be adjusted otherwise the WebLogic JVM process did not start for me. But since the Dockerfiles are shared on GitHub it's easy to contribute. Bruno Borges and Monica Riccelli from Oracle are doing a great job in making all that to work and being certified by Oracle. Thank you guys! When running the ManagedServer (MS) type of container the MS is not started automatically. With some WLST scripting it could be improved I think. 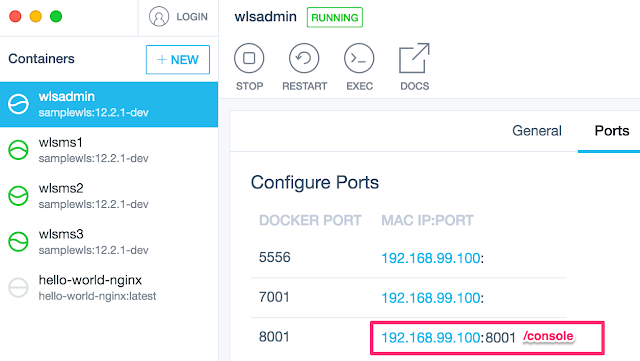 Using docker-compose it should be possible to set up a cluster configuration and easily run it with: docker-compose up. So there is still changes going on but in terms of simplification and improvement. I hope to see Docker Compose And Swarm for WebLogic working soon. But it will need some time because compose/swarm is sill experimental. There might be some networking issues at the moment of this writing. - a sample for multihost networking has been produced and is published under samples/1221-multihost. It uses Docker Machine though. It is important to note again, that all these scripts are samples and pointers on how to get started, but they are not certified or supported by Oracle. What we support w.r.t. WebLogic on Docker, is documented in the links that Andreas shared at the end of this article. thanks for the quick reply and fixes. I put some "Update on 12/20/15: ..." comments (in green) in the original post to reflect the recent changes. Thanks again for your continuous community engagement plus making WLS working on Docker! I think your post makes it easy to run weblogic in docker, however I don't really see this usable in a real life enterprise environment with multiple managed servers spanning over more servers. Especially node manager, trust and credentials. 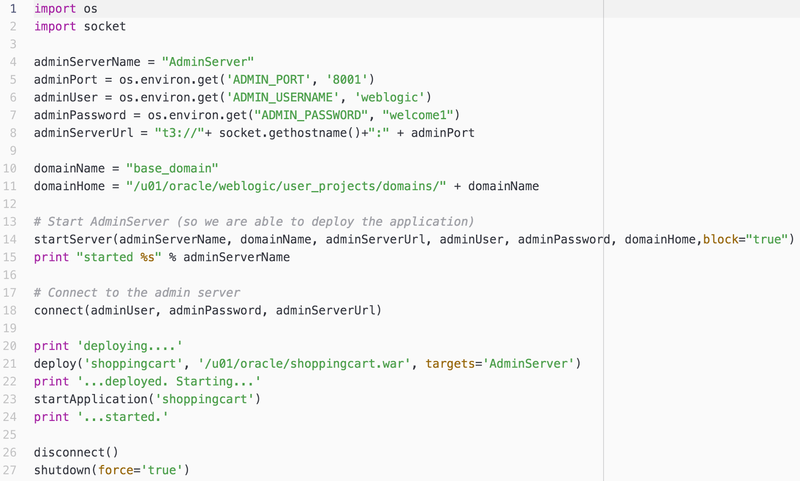 It's very seldom that you have a 1:1 weblogic, and applications because it's a J2EE container. Can you share your ideas on this matter? Thank you guys (Andreas and Bruno) for your blogs and samples!! Hi Andreas, I have an issue about restarting managed servers containers. After the restart (docker stop container_name/ docker start container_name), the managed server in the weblogic console is always shown as a new server with a different name than the original server. The original server also remains in the console but it's in the SHUTDOWN state. So I always have to delete the origin servers which was working before the restart. It is a bug or feature? Thank you. @Ibraso, try latest scripts from the sample 1221-domain. This issue has been fixed. Scripts from the 1212-domain work fine. Thanks. @Bruno I am struggling to run wls on multi-host, followint your github workshop link https://github.com/oracle/docker-images/tree/master/OracleWebLogic/workshops/multihost. runnung into issues when Iam running bootstrap.sh , docker-machine create -d virtualbox . I am trying your workshop on VirtualBox VM , also tried installing virtualbox inside that VM , still not able to run successfully. @gsn Admin please reach out to Github / Twitter to contact Bruno.